Saturday’s 54th Vanier Cup Presented by Promutuel Insurance saw the same matchup as last year between the Western Mustangs and the Laval Rouge et Or, but it ended with a very different result. Last year in Hamilton, No.2 Western beat No. 1 Laval 39-17 thanks to strong play from quarterback Chris Merchant, who won the Ted Morris Memorial Trophy as game MVP. This year at Laval’s home field of TELUS-UL Stadium, the No. 2 Rouge et Or downed the No. 1 Mustangs 34-20 in front of 12,380 fans to claim their 10th Vanier Cup, extending their own U SPORTS record. And Laval’s fifth-year quarterback Hugo Richard won the Morris Trophy after a great showing, capping off his remarkable U SPORTS career. Richard joined the Rouge et Or in 2014 and made an immediate impact, claiming the national rookie of the year award and being picked as a second-team all-Canadian. Laval finished first in RSEQ in the regular season both that year and in 2015, but lost the Dunsmore Cup (the Quebec championship) to the Montreal Carabins both years. 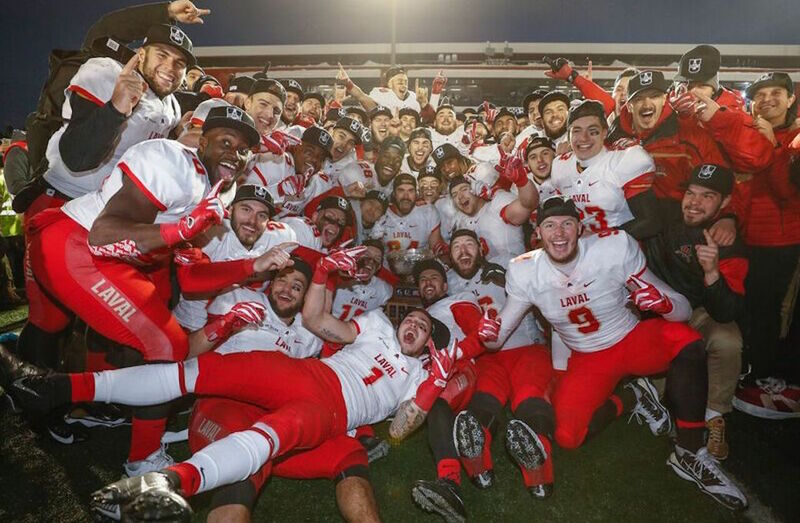 In 2016, though, they finished second in the regular season, but beat Montreal in the Dunsmore Cup, took down the Laurier Golden Hawks in the Uteck Bowl, and then edged the Calgary Dinos 31-26 in the Vanier Cup. That 2016 game saw Richard earn the Morris Trophy after throwing for 339 yards and two touchdowns and rushing for 62 yards and another touchdown. 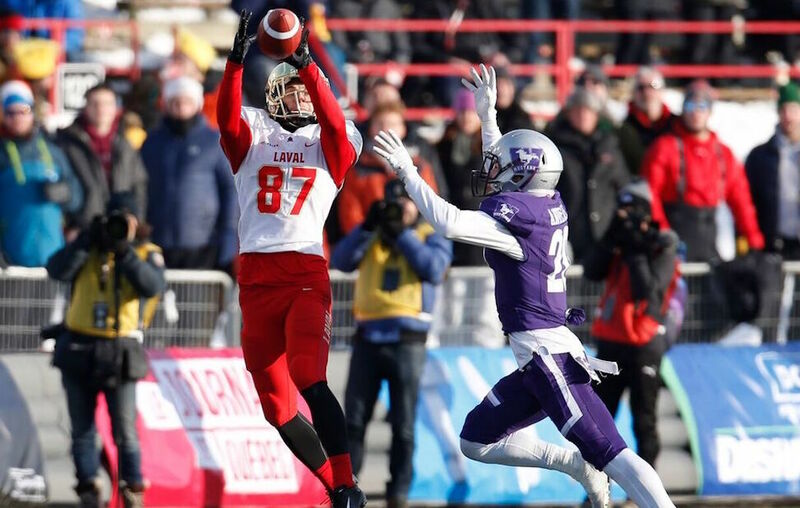 Last year, he led Laval on another great run, but was outdueled by Merchant in the Vanier. This year, Richard turned the tables, completing 23 of 31 passes (74.2 per cent) for 348 yards and two touchdowns with no interceptions and rushing 10 times for a team-high 60 yards (6.0 yards per carry) and another touchdown. Merchant put up a good showing of his own, too, throwing for 358 yards and a touchdown and rushing for 81, but the Rouge et Or defence picked him off three times and held him to 26 completions on 46 attempts (a 56.5 per cent completion rate).Richard’s efficiency and turnover avoidance was key to Laval’s victory, and he earned special praise from head coach Glen Constantin afterwards. Beyond Richard, another key star for Laval was third-year linebacker Adam Auclair, who recorded a game-high 10.5 tackles and added an interception. Auclair, who was given the Bruce Coulter Award as the defensive player of the game, made two massive plays at the start of the second half that helped to swing the game. The halftime score was just 17-13 in favor of the Rouge et Or, but Auclair changed that, first recording a tackle for loss that caused Western to punt (setting up a Laval touchdown) and then intercepting Merchant on the following drive (which led to a field goal that put the Rouge et Or up 27-13). The win is significant for the Rouge et Or on a number of statistical levels. It not only furthered their lead in Vanier Cups won (Western is second with seven), it also gave them their fourth perfect season wire-to-wire (following 2008, 2010 and 2013). And it snapped the Mustangs’ 23-game winning streak, which was coming close to the U SPORTS record of 25 Laval set between 2012 and 2014. The Rouge et Or now have a 12-game streak of their own going; we’ll see if they can add to that next season. Two major U SPORTS swimming competitions took place this weekend, the Canada West championships (hosted by the Calgary Dinos) and the OUA Fairweather Division championships (hosted by the University of Toronto Varsity Blues). In Calgary, the UBC Thunderbirds emerged on top once again, sweeping the men’s and women’s banners for the sixth consecutive season. In Toronto, the Varsity Blues claimed both the men’s and women’s titles at home. The Canada West championships saw the UBC women extend a remarkable streak of dominance, picking up their 10th consecutive conference title and doing so decisively. They posted 979 points over the three days, and outscored second-place Calgary by 274; Alberta, Victoria and Manitoba placed third through fifth. Thunderbirds’ swimmer Hoi Lam Tam set two conference records on the weekend, recording a time of 54.44 seconds in the 100-metre freestyle and a time of 25.12 seconds in the 50-metre freestyle. Manitoba’s Kelsey Wog was named female swimmer of the meet after posting four out of the five top performances on the women’s side, including dominant showings in the 200-metre breaststroke and the 200-metre freestyle. On the men’s side in Calgary, the contest was much closer. UBC scored 800 points, but Calgary was only 98.5 back. Victoria, Alberta and Regina rounded out the top five. The Thunderbirds’ Markus Thornmeyer was named the male swimmer of the meet after a bevy of impressive wins, including in the 200-metre freestyle and the 400-metre individual medley. Josiah Binnema also impressed for UBC, posting wins only minutes apart in the 100-metre butterfly and 200-metre breaststroke Saturday. The division championships in Toronto featured the Varsity Blues, the Western Mustangs, the McMaster Marauders and the Waterloo Warriors, teams that finished in the top six on both the men’s and women’s side at the OUA championships last year. The Varsity Blues’ women won all 19 of their races, finishing with 1,214 points (Western was second with 657.5), while the Toronto men won 11 of 19, earning 1,179 points (Waterloo was second with 863.5). SWIM: Your Varsity Blues are tearing it up on Day 2 of the OUA Fairweather division championships! Varsity Blues’ rookie Ainsley McMurray stood out on the women’s side, recording wins in the 50-metre butterfly, the 100-metre freestyle and the 200-metre freestyle. Matt Dans, Mitch Ferraro, Matthew Mac and Everett Smith all won two races for Toronto on the men’s side. A big event game this weekend in basketball saw the Saint Mary’s Huskies and the Dalhousie Tigers men’s and women’s teams face off in front of 800 fans at Halifax’s Scotiabank Centre (home of this year’s Final 8), wrapping up the first half of the AUS regular season in style. The men’s game saw the No. 5 Huskies pick up a 73-68 overtime win over the No. 8 Tigers to improve to 6-0 on the season, while the women’s game saw the Tigers win 78-58. On the men’s side, this one was close throughout, with Dalhousie leading 11-9 after the first quarter and 27-26 at the break. Saint Mary’s responded with a strong third quarter, outscoring the Tigers 18-12 in that frame, but Dalhousie battled back to send it to overtime at 60 points apiece. There, though, Saint Mary’s jumped out to a quick five-point lead that they never relinquished. Keymar Alleyne led the way for the Huskies with 19 points, seven rebounds (six on the offensive glass), and four assists, while Brent Martindale added 13 points and seven rebounds (two offensive). Alex Carson led the Tigers with 18 points. On the women’s side, Dalhousie only led by four points after the first quarter (19-15) and again at the half (34-30), but the Tigers were able to pull away in a 21-9 third quarter and then outscore the Huskies 23-19 in the final frame. Sophie Gaube led the way for Dalhousie with 24 points and five assists, while Robertha Charles chipped in 19 points, four rebounds and four steals and Diedre Alexandre had eight points and seven rebounds. Arianna Macias had 23 points and five rebounds for the Huskies. Across the country, the other Huskies (from the University of Saskatchewan) hosted a pair of wrestling meets this weekend, and their women’s team picked up some impressive results. The No. 3 Huskies women beat the No. 2 Alberta Pandas in a dual meet Friday, then bested the No. 6 Calgary Dinos, the Dinos WC, and the Pandas in the Huskie Open Saturday, scoring 43 points to 41, 25 and 24 respectively. Alexandra Schell, Emma Parker and Maddison Haney earned gold medals for the Saskatchewan women in the 48-, 63- and 67-kilogram classes respectively. On the men’s side, the No. 2 Alberta Golden Bears beat the No. 3 Huskies in a dual meet Friday, then downed Calgary and Saskatchewan in the Huskie Open Saturday, finishing with 63 points to 48 and 42 respectively. Elsewhere in wrestling, the Ontario Senior Championships were held this weekend with several U SPORTS athletes participating. Some notable winners came from the Brock Badgers (No. 1 on both the men’s and women’s sides in the latest U SPORTS Top 10), including Ligrit Sadiku (men’s 61-kilogram class), Cruiz Manning (men’s 65-kg class) and Kristina McLaren (women’s 50-kg class). A full list of those results can be found on the Ontario Amateur Wrestling Association site here. The Victoria Vikes hosted the Canadian University Men's Rugby National Championship this week in partnership with Rugby Canada, and it was the UBC Thunderbirds who came out on top for the second consecutive year. This time, UBC beat the Queen’s Gaels 21-10 in the final to claim the Spence McTavish Trophy, while the host Vikes took third with a 34-21 come-from-behind win over the Concordia Stingers in the bronze-medal match. That final saw Queen’s take the lead in the 22nd minute on a try from Trevor Helgason, while UBC responded with a penalty from William McDougall- Percillier to cut the lead to 7-3 at the half. The teams exchanged further penalty kicks in the second half before the Thunderbirds pulled in front for good thanks to a 44th-minute try from Joe Sourisseau and another one in quick succession from Cole Keffer. MacDougall-Percillier then capped it off with another penalty in the 58th minute to seal the win for the Thunderbirds. A full recap of that championship match can be found here. Other notable Vanier Cup figures included Sportsnet’s Tim Micallef, in his 18th year covering U SPORTS, and referee Walter Berry, in his 44th year of officiating. I think nothing beautiful comes without a fight.